LED lights are brighter, longer lasting, and radically more efficient than traditional bulbs but there’s one thing they aren’t: cheaper. Fortunately rebates abound and you can pass the cost of your LED lighting upgrade onto someone else. Read on as we show you how. Although the cost of LED bulbs has dropped significantly over the last few years they’re still nowhere as cheap as traditional bulbs. They are, however, much longer lasting and much more efficient. Not only will an LED bulb last you decades but it will provide the same illumination as an incandescent bulb for a fraction of the price (typically outputting an equivalent amount of light but using 1/8-1/10th the power). Still, even with the benefits and long-term savings clearly outlined it’s tough to bite the bullet on a $10 LED bulb. Fortunately for our collective pocketbooks there is a enormous amount of money dedicated to promoting energy efficient upgrades funneled into consumer pockets by energy conscious utility companies. How much money exactly? Billions of dollars every year. In 2008 alone, for example, energy efficient upgrades netted consumers over 3.1 billion dollars. While that money is spread across upgrades of all sorts (installing a more efficient furnace, higher R-value windows, and other upgrades can net you energy rebates) a not insignificant portion of it is dedicated to upgrading older and more wasteful lighting to efficient LEDs. Further the rebates are pretty significant (expect to save anywhere from $2-6 per bulb). So what’s the catch? The catch is that most utility companies only provide lighting for 60w-equivalent warm white bulbs (the most frequently used residential bulb). While some utilities do provide rebates for other wattage and color combinations (e.g. 75w-equivalent daylight bulbs) it’s much rarer. That said, compared to the hassle and cost of major upgrades like installing a new furnace installing new light bulbs is a trivial way to save money. Let’s take a look at just how easy it is and where to score discounted bulbs. Before we proceed it’s worth noting that many of the same rebates apply to CFL bulbs but when possible we recommend LED over CFL as you gain a longer-life bulb, ditch the risk of mercury-contamination, and enjoy instant-on and flicker-free light. There are two principal ways you can score discounts on new energy efficient bulbs: instant discounts and mail-in rebates. The most common rebate type for consumer-purchased lighting is an instant discount. To encourage consumers to purchase energy efficient lighting the discount is applied instantly at the time of purchase to the light bulb in the form of a utility-supplied subsidy. From a consumer standpoint the bulbs are always on sale and the utility company is applying instant coupons. Look for signage, as seen in the photo below, at your local retailers. You’ll typically find fine-print on these instant rebates that indicates the rebate is limited to X number of bulbs per household (a value which ranges anywhere from 5 to 30+ bulbs depending on the utility company). We’ve never heard of this limit being enforced in anyway, however, and we’ve never been asked for identification or restricted in purchasing identical bulbs. Short of purchasing more than the restricted amount in a single purchase we can’t imagine there ever being an issue. Typically mail-in rebates are restricted to commercial upgrades. Although it isn’t completely unheard of for utilities to mail-in rebate for consumer lighting purchases such rebates are usually only for large and expensive upgrades of entire light fixtures. Outside of that you’ll usually find that mail-in lighting rebates are for businesses engaging in large scale lighting overhauls. If you’re reading this and considering upgrading both your home and business to more efficient lighting don’t be put off by the hassle of mailing in your rebates. While home savings are high when it comes to LED upgrades office savings are even higher given the sheer number of bulbs that are on (and the duration in which they are used each day). 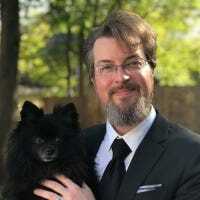 Although instant rebates are usually very clearly labeled in stores, roaming around from store-to-store in search of them isn’t a very particularly efficient way to go about finding them. Thankfully there’s a much easier way to figure out which stores near you stock rebate-friendly bulbs. Although you’ll find more than a few energy-rebate databases online they all pale in comparison to (or directly steal the data from) the Energy Star website. Hit up the Energy Star Rebate Finder and plug in your zip code to find all the rebates in your area. You can drill down through the results by specifying just light bulbs and fixtures but you may want to leave it wide open just to see what other energy savings you can take advantage of. The Energy Star website does a good job specifying the utility, what kind of discount you’ll get, and the range of the discount. Further, it will provide a direct link to the utility company in question which brings us to the next step. While the Energy Star database is great for finding what kind of rebates are available in your area it is a bit light on the specifics. If you want additional information (like local participating retailers) it’s very helpful to hit up your local utility company’s web site. In the previous section, for example, we saw that Baltimore Gas and Electric Company (BGE) has instant rebates of up to $7 on LED bulbs. Where can we find them though? By clicking through the link on the Energy Star search results to the BGE website we can jump to the energy rebate page, use the store locator, and get a map of local stores participating in the energy rebate. 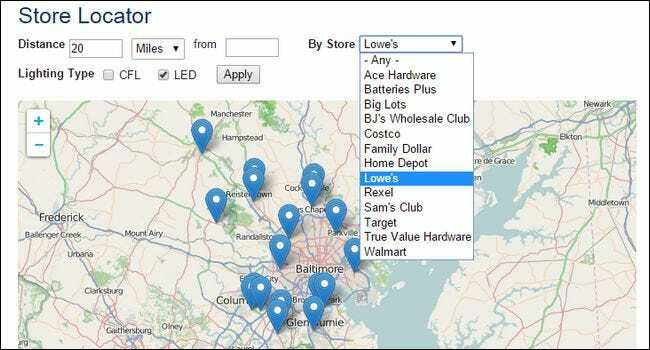 Not every utility website has such a handy locator, but nearly every site we checked from a randomly selected pool off the Energy Star list of nationwide LED rebate providers had a participating retailer list. With a little searching, a trip to the store, a few minutes spent swapping bulbs you can enjoy energy efficient lighting subsidized by your local power company and national energy saving initiatives.